WWE has made a few announcements for tonight's episode of Raw. It's been confirmed that Triple H and Shawn Michaels will be appearing on tonight's show to further the build to their tag match against The Undertaker & Kane at Crown Jewel in Riyadh, Saudi Arabia on November 2. A pre-recorded video with Undertaker and Kane aired on Raw last week, and Undertaker then appeared on SmackDown 1000 to send a message to Triple H & Michaels. This week's Raw is the go-home show for Evolution, and the show will include a contract signing segment for Ronda Rousey and Nikki Bella's Raw Women's Championship match at the pay-per-view. Sasha Banks will also face Ruby Riott tonight. That comes in advance of Banks, Bayley & Natalya taking on The Riott Squad (Riott, Liv Morgan & Sarah Logan) in a six-woman tag at Evolution. 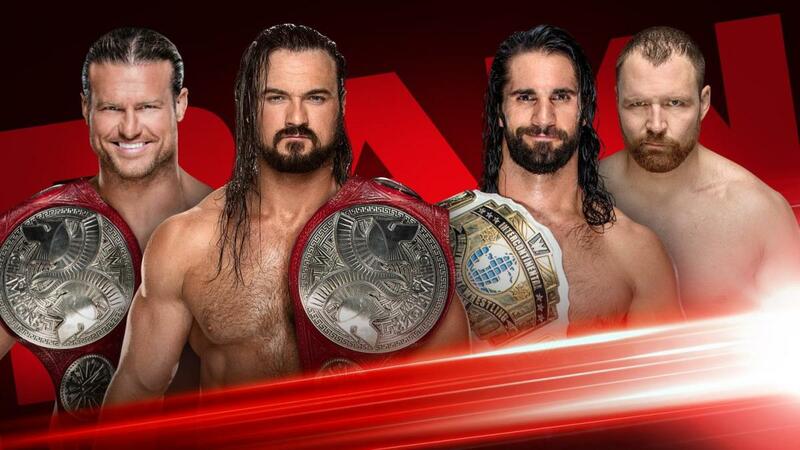 A Tag Team Championship match is set for tonight, with Dolph Ziggler & Drew McIntyre defending their titles against Seth Rollins & Dean Ambrose. Last week's Raw continued to tease the storyline of dissension between Ambrose and The Shield, but the episode ended with The Shield defeating Braun Strowman, Ziggler & McIntyre. Strowman laid out Ziggler after the match, then McIntyre hit the Claymore Kick on Strowman. UPDATE: Finn Balor vs. Bobby Lashley is also official for tonight.